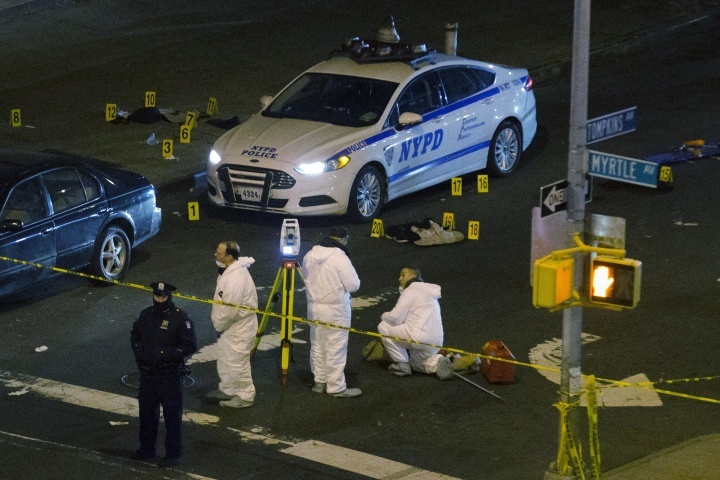 Today was a bad day to be a police officer – 2 New York City cops were murdered execution-style by career criminal Ismaaiyl Brinsley. Brinsley, who had shot his girlfriend hours before, committed suicide in a subway tunnel after the murders. “Officer Ramos and Officer Liu never had the opportunity to draw their weapons,” he continued. “They may never have had the chance to see their murderer.” Bratton also confirmed that Brinsley, whose last known residence was in Georgia, shot his ex-girlfriend in Baltimore on Saturday morning before traveling to New York. According to the Baltimore Sun, the 29-year-old woman is currently in a hospital in serious condition. Sharpton’s backpedalling doesn’t mitigate his involvement in – and partial responsibility for – these killings. Such is the power of the bully pulpit and make no mistake, Sharpton is a bully who uses his race as a weapon. In fairness, the reprehensible Sharpton’s involvement with the Brown-Garner protests doesn’t mean that police killings are not a problem. Cops are employed by the people to serve and protect, not to act as executioners, and public oversight of their actions is both right and necessary. In our system, that oversight is ultimately the function of the grand jury and, the protests to the contrary, both cases were thoroughly reviewed by citizen panels. Although the decisions weren’t to the rioters satisfaction, justice was probably served – to the extent possible. I say probably, because justice is not – and can never be – a binary function, not in cases like these. But today’s police killings are another thing entirely. 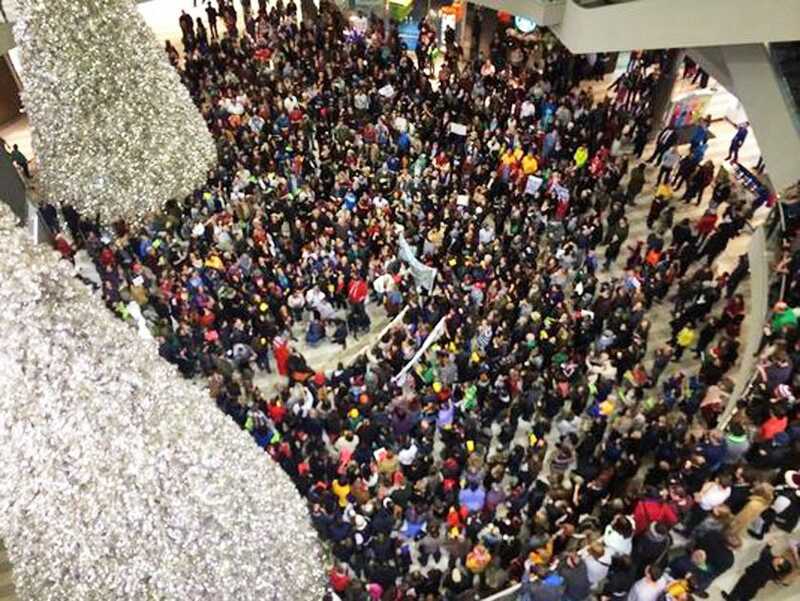 Nearly simultaneously, more protesters disrupted business at Minneapolis’ Mall of America. 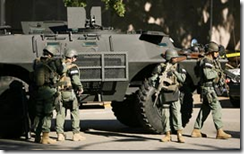 12 people were arrested for protesting illegally on private property, but no major violence was reported. Black lives do matter. They do. However, they do not matter more than anyone else’s. That is the definition of equality and this point is a non-negotiable truth of American life. The problem with the anti-police protests and Sharpton’s race-baiting demagoguery is that both ignore another fundamental American truth, which is that minorities commit a vastly disproportionate number of crimes in this country. The African-American population accounts for approximately 12% of American citizens, but according to the US Department of Justice, blacks accounted for 52.5% of homicide offenders from 1980 to 2008. Similarly, in 2008, black youths, who make up 16% of the youth population, accounted for 52% of juvenile violent crime arrests, including 58.5% of youth arrests for homicide and 67% for robbery. I feel obligated to defend these statistics by reminding the reader that the data have nothing to do with racism – they represent hard, cold facts. Unfortunate, but nonetheless true. The corollary to these statistics is that, the more crimes a group of citizens commits, the more run-ins members of that group are going to have with with police. So, it’s hardly surprising that African-Americans are “disproportionately” involved in violent encounters with police, relative to their percentage of the overall population. Another blow to the myth of African-American’s being unfairly targeted for killing by whites is the fact that most murders are intra-racial, with 93% of black victims murdered by blacks. In contrast, 84% of white homicide victims murdered by whites, meaning that, if anything, the exact opposite is true. But that is a subject for another time. In the moment, what is important to realize is that this country’s police forces are not in the business of oppressing the citizenry, regardless of their race, creed, or color. Criminals are criminals and the law is the law. Everyone in America knows the rules of behavior and the consequences for violating those rules. Being a criminal is an active choice these people make. This cannot be denied, even by men like Al Sharpton. Regardless of the Brown-Garner cases, the choice before us is simple: If Sharpton and the worst of those whose passions he has chosen to inflame are going to deliberately stalk and execute police officers, the American people will have to choose sides between those who enforce law-and-order and those who circumvent and destroy it. The story of the day is one of madness, for what other word can describe the actions of a man who guns down dozens of innocent people in a purposeless act of rebellion? 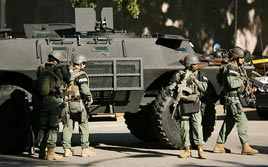 Major Nidal Malik Hasan killed at least 12 of his fellow soldiers today at Fort Hood and no one really knows why. Perhaps he was, as reported, fearful and resentful about an upcoming deployment to Iraq. Apparently Hasan’s loathing of the Army’s mission in that country was so great that he hired an attorney to help him get out of the military. Frankly that explanation doesn’t pass muster. Anyone who works, in any line of business, has to do things that he or she doesn’t want to do, often for months at a time and under difficult circumstances. Although the stresses of most of our daily 8-to-5s can’t compare to those experienced by our deployed military personnel, the comparison is still a useful tool. Considering it’s unlikely that a trained psychologist like Hasan would be put into a front-line situation, it seems that he would have had relatively little to fear in terms of his personal safety had he been sent overseas. Hasan attended the Muslim center for about six years and seemed like a good person, [Muslim Community Center in Silver Spring President Ishtiaq] Chughtai said. Hasan had some “difficulties” that required counseling and extra supervision, said Dr. Thomas Grieger, who was the training director at the time. Grieger said privacy laws prevented him from going into details but noted that the problems had to do with Hasan’s interactions with patients. “He was making outlandish comments condemning our foreign policy and claimed Muslims had the right to rise up and attack Americans,” Col Lee told Fox News. “He said Muslims should stand up and fight the aggressor and that we should not be in the war in the first place.” He said that Maj Hasan said he was “happy” when a US soldier was killed in an attack on a military recruitment centre in Arkansas in June. An American convert to Islam was accused of the shootings. Col Lee alleged that other officers had told him that Maj Hasan had said “maybe people should strap bombs on themselves and go to Time Square” in New York. As Marshall says, things may get very dark indeed with regard to Hasan’s true motives if Lee’s assertions about Hasan’s Muslim sympathies prove true. Previous cases indicate that this is a line of questioning that should be scrupulously followed up on. For if Hasan’s fear of being deployed to a war zone is, as I believe, insufficient to explain his cowardly, murderous actions, his motivations must have come from a deeply rooted personal sense of vengeance. While it is premature to conclude that Hasan’s religious and social beliefs caused him to commit mass murder, it’s nevertheless obvious that this should be a primary line of inquiry, wherever it leads on the path to the heart of darkness. Darker still are the larger questions about whether followers of Islam can truly belong in a democratic society. Millions do fit in successfully, just as Nidal Hasan did, to all appearances, prior to today’s shooting spree. There is a tension between religion and government in democratic societies. Despite founding the first modern democracy here in the United States, American Christians feel it. I suspect that Muslims feel it more keenly yet what with the demanding, legalistic nature of their path to salvation. Can that tension be resolved to the benefit of democratic society? Or is Islam inherently detrimental to democracy? This is the darkest question of all: Must Islam always seek to undermine secular government in order to gain power, as it has in Turkey and, to a lesser extent to-date, in many European countries? Certainly it has in the past and still does in the present. But must it? If the answer is Yes, that democracy and Islam are oil and water, never mixing, always distinct, constantly fighting, then hard times and hard choices lie ahead for the citizens of western democracies. A man can only serve on master. One wonders what Nidal Hasan served. The Obama administration will no longer pursue the course of harassing patients using medical marijuana or their providers in states where the drug is legal for that purpose. On the point of marijuana, it also holds some promise as the first step in reviewing the war on the herb that costs us billions of dollars and infringes on personal liberties while attempting to protect us from ourselves — and a product less lethal than alcohol. Maybe we can finally have a rational debate on at least this front of the “war on drugs,” which has done more damage to federalism than Democrats or Republicans combined. First, it must be said again that the War on Drugs is both a disaster and a farce. It’s done little except waste billions of dollars and cause a run-up in crime and gang-related violence. This outcome was predictable given the American experience with Prohibition, another bad idea that empowered the federal government overmuch. Second, the Bush administration’s puritanical pursuit of medical marijuana miscreants clearly violated the rights of states to make the final judgment about the criminal code within their own borders. If anything, the Obama administration’s decision doesn’t go far enough. Rather than merely stating that it won’t enforce federal laws, it would be better to remove them from the books entirely. Why not begin that process immediately?